Having known of Hate Forest for many years, it is only recently that I decided to give them a chance to prove their worth with their sophomore full-length, entitled ‘Purity’. Usually, I don’t consider record titles to be all that important in regards to defining their sound. Obviously, a title, as well as artwork, are usually the first two things that jump from off the page and grab a prospective listeners attention but, as far as being an apt description of the material present on the actual record itself, the title usually doesn’t surmise the sound well enough to warrant discussion on a review. However, in the case of ‘Purity’, I feel it does. The title definitely describes the music itself very well. In fact, if I were asked to describe this record in one word, “pure” would be a perfection adjective to use. The material is primitive and cutthroat, something which I’d normally expect from Western European bands. There is, to me at least, a stigma when it comes to Eastern European bands, particularly those that consider themselves to be of the ambient persuasion in the black metal scene. This stigma involves a type of music which feels very artsy and lacking in many traditional influences. In the case of Hate Forest, even going by the song titles like ‘Desert of Ice’, I feel there is a buried influence from the second wave legions, perhaps the early, raw French black metal bands that pioneered using an uncompromising sound full of distortion and repetition to project their mystical themes. Hate Forest, like many others before them, have opted for just this type of black metal -- repetitious, raw and powerful, a type which doesn’t allow too much chance for a sense of creativity to breed within the tightly packed atmospherics. This is where the use of the word “pure” is imperative since it gives the reader an impression that Hate Forest are amongst the few who, in the modern scene, can still conjure up feelings of nostalgia towards the first and second waves where pure black metal was dreamed up and made a startling reality, much to the disliking of a number of members of the “upstanding community” who greatly opposed this form of blasphemous music. With Hate Forest’s ‘Purity’, one really gets a sense of penetrative power and presence in their performances. I’m not overly familiar with their others records, though I am fond of Blood of Kingu, the band which Hate Forest eventually involved into. Blood of Kingu however, are a much softer sounding band than this one. The guitars and overall distortion based sound doesn’t offer the same impact of their debut, as it does on Hate Forest’s sophomore. The atmosphere is toned down and the approach feels slightly more mature, with a lessened sense of hatred and downright loathing of modern society. Alongside fellow band Drudkh, Hate Forest offer their odes to nature in the form of leading guitars. The rest of the instrumentation takes a back seat to the guitars and tends to attempt to enhance what they’re projecting by simply playing the same material as an underlying element. Surprisingly, despite the lack of ambition in the form of a distorted and repetitive sound, the bass flows audibly beneath the guitars and does feel a tad more adventurous than the guitars, but a style like this quickly hunts down and suffocates any aspect trying to fulfill its destiny by playing in the limelight above the guitars, unintentionally taking away the focus from them. This occurs throughout, but particularly on songs like ‘Elder Race’, a song which really drives home the feeling of pride in the soundscapes and probably in the lyrics, too, as the lyrical themes suggest Hate Forest revolve around ideals such as Aryan and Slavic mythology. There is a potential problem with the lyrics, as some people don’t like to get involved with bands of a political persuasion. Vocally, I’m not very fond of Hate Forest. The vocals do tend to vary, again, as shown on ‘Elder Race’ which features prominent death metal-esque growls (though they’re not at all perfected, sounding rather flat against the buzzing distortion and production), though some light rasps do feature from the backing vocalist. These are sparse however. I do feel the record would have benefited more from a rasping style, rather this the deathly growls which remind me of Mikko from Clandestine Blaze. The vocals are largely unimpressive amidst some truly grandiose atmospherics, particularly on songs like the intense ‘The Gates’, which features some scorching hot riffs akin to Drudkh. 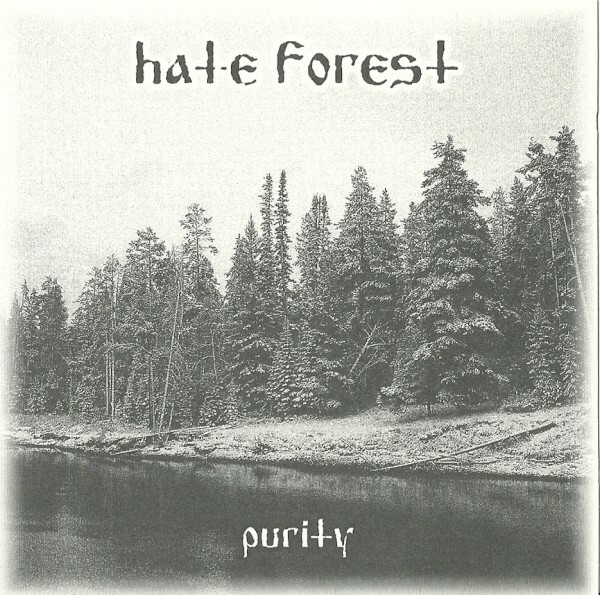 Potentially, Hate Forest could have had a winner in ‘Purity’, but the lacklustre drums and flat vocals mare this otherwise well displayed black metal record.